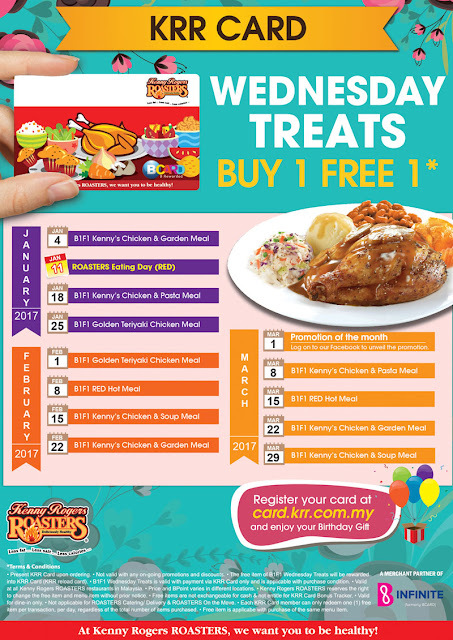 Mark your calendar for KRR Card Wednesday Treats from January till March 2017. Special offer for KRR Card members only. Not yet a member? Visit our restaurants & sign up one today! Period: Every Wednesday (January to March 2017). Not applicable for ROASTERS Catering/Delivery & ROASTERS On the Move. Present KRR Card upon ordering. Valid at all Kenny Rogers ROASTERS restaurants in Malaysia. Each KRR Card member can only redeem one (1) free item per transaction, per day, regardless of the total number of items purchased. Free item is applicable with purchase of the same menu item. Prices vary at different locations. All price above are final price inclusive of 6% GST. Berjaya Roasters (M) Sdn. Bhd. reserved the rights to amend the above Terms & Conditions without prior notice.